Discussion in 'The Lounge' started by jonKranked, Jun 28, 2013. Ok, seriously with the rain already. WTF. I think it's actually drier at the bottom of the ocean. OK, I was so desperate with this weather that I went for a half hour run last night. I hate running. But I am hating this weather even worse. Beach this weekend and trail ride with Jr, beotches! turns out my yakuza might not be completely hosed after all! Still some cracks in the CNC, but I'mma JB weld the **** out of it and ride the morewood till I get bored. It's, well, raining. I might as well be in Hilo, but no ocean and no fire coming out of the ground. It occurs to me that I am more ashamed of the cosplayers on my wife's side of the family than I am of the various raging alcoholics. alright, who wants to take bets on which group dog will eventually and inevitably wind up in - the alcoholics or the cosplayers? Mornin! Booked myself a spot at the Burke Mountain campground next weekend. Looks like all my siblings may end up there with us; I shall most certainly partake in the Kingdom Trails. It's gonna have to be the alkies cause I ain't wearing no ****ing Crocs. day 12 out of 21 days straight with no days off. its going to hit 100* and I'm driving the fat bus....had to transport a 260 pound poor hygiene, crappy cigarette smoking clothing reeking of cat pee woman yesterday, wonder what joy today will bring? "hey baby i bet you taste like cholesterol"
Howdy all. Life has been busy. I've been in Seattle since Monday, I think (? ), but am still living out of a suitcase as the mother in law's house is just strewn with unopened boxes. For extra stress-fun on top of figuring out my new, long commute to work, our old landlord in Long Island is trying to collect additional money beyond our security deposit. Thoughts from the peanut gallery on whether this is legit? I'm going to go ahead and just ignore them since I'm now in a different state, methinks. our old landlord in Long Island is trying to collect additional money beyond our security deposit. Thoughts from the peanut gallery on whether this is legit? I'm going to go ahead and just ignore them since I'm now in a different state, methinks. Hey you East Coasters... send some of that MF'n rain this way, will yah? B1tches! I think that the landlord would have to show reasons why for this (ie damage with estimate for repairs). also, it has to be damage specifically caused during your residence there. they can't charge you for routine upkeep. In MA, at least, he'll have to provide with a detailed list of damages in a specific amount of time, if he doesn't, he owes YOU money, technically. If he did, and you do owe, he'll still have to take you to small claims, convince the judge that you owe, convince the judge to award him damages that you owe, then convince you to pay the damages that the judge awards. It is not an easy process, and he's not likely to bother. You'd have to have really screwed up for him to chase you down. Was sunny in Portland yesterday, but rainy on the coast. Today, we go to Mt hood. i'm pretty sure that's the case in most states. when we moved out of the house we were renting our landlord charged us some fees, and i made her provide me an invoice. Wife and woman-child going to Hama's house for the weekend. Just in time for the Central Valley to be near/breaking record temps. HAHA! 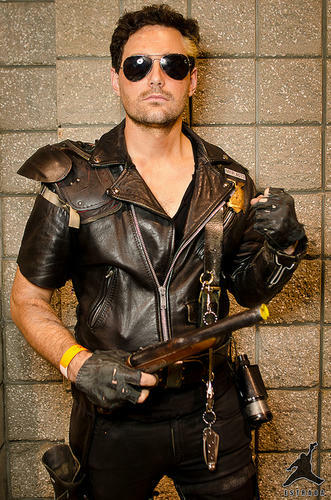 You know he has an secret, unrealized urge to do some Mad Max dress up. I could pull off Capt Jack because I (apparently) look quite a bit like Depp. Could prolly get a bunch of BJs from fat chicks in bad costumes. So there's always that. You're lucky you don't work in the South Eric. That would be considered "average body type" on dating sites here. She provided a list with estimated repair prices. A lot of it seems not our fault/not as portrayed, inflated, petty, or exaggerated. As I'm across the country I'll just wait for her to try to serve me in NY small claims court. If she does I'll file a counterclaim and show up to contest it all (specifically for the fact that we had no locked door between us and the illegal downstairs tenant they moved in for about 18 months). If I'm never served I'll continue to live my life out.